my latest love..... — Pencil & Paper Co. 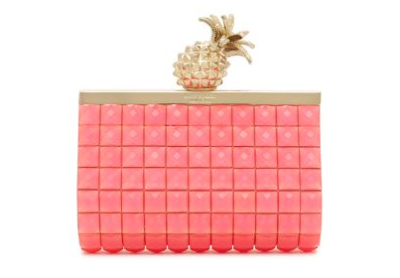 I think this little clutch from Kate Spade is so charming! I just adore the hot pink color and the whimsical jeweled pineapple closure! I think it would be of course great with a little black dress and lots of fun gold jewelry, but also love the idea of wearing it more casually! I'm thinking olive green fitted cargo pants paired with a simple tank top and tan sandals! I bit pricey...but so versatile!